My February 26, 2008 op ed in the Dallas Morning News seems to have excited a great deal of interest, including on this blog. I really enjoyed my speaking tour of Texas, including being on the Dallas PBS TV program named Think, talking about Carbon-Free and Nuclear Free. See the video here. Watch the video anyway. You’ll like it. Krys Boyd was a really knowledgeable and gracious host at KERA TV. If you love my mellifluous voice on that, see clips from one of my Dallas area speeches, courtesy of the Dallas Peace Center. There is bad news on climate and good news on energy. 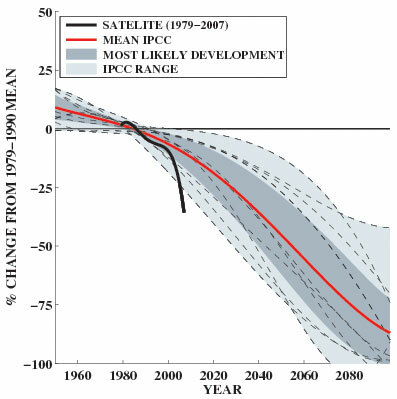 Chart is courtesy of Dr. A. Sorteberg, Bjerknes Centre for Climate Research, University of Bergen, Norway. There is good news to offset the bad news: My book Carbon-Free and Nuclear-Free shows that we do not have to go to the poor house to eliminate carbon dioxide emissions from fossil fuels. We can have a flourishing economy and protect climate. Wind energy in good areas is already cheaper than nuclear or competitive with it. The country needs sensible rules for investment in transmission lines to create more of a boom in wind. It’s already happening in Texas, which has such rules; some oilmen like T. Boone Pickens see wind farms as the future of energy. See the New York Times article. In the United States, the area of parking lots and commercial building rooftops is large enough to supply much or most of its electricity requirements. And Nanosolar, located in Silicon Valley, is all set to make solar panels on a large-scale for less than a dollar watt (plus installation). That means solar electricity is likely to make nuclear energy economically obsolete by the time the first proposed new nuclear plants come on line (if all goes according to the nuclear industry’s plans), making for another generation of economic lemons, for which ratepayers and taxpayers will pay a heavy price. Why go there? New Zealand has announced a goal of zero CO2 emissions without nuclear power by mid-century. Why not the United States? Declaring that to be a goal and enacting the tough policies that will be needed could work wonders for restoring the positive image that most of the world’s people once had about the United States, which has fallen into sad disrepute abroad in recent times. S. David Freeman, former Chairman of the TVA, noted in his Foreword to my book, that it will take “determination and guts …[to] achieve a renewable energy economy.” That means your involvement. Take the message of Carbon-Free and Nuclear-Free to the candidates of all parties, independent of those whom you personally support; ask them if they are familiar with Carbon-Free and Nuclear-Free, which shows we can live well without fossil fuels or nuclear power. You can do more. Link to this blog; comment on it; make it the go-to place for energy commentary, discussion, and Q&A about the energy problems of our time. Read my book. Download it free. Discuss it in your book club. Posts to come: On China and India; on efficiency; on the coming generation of passenger vehicles. Categories: Energy Systems. Tags: carbon-free and nuclear-free, climate change, and electrical system. Posted on March, 2008. Last modified on December, 2012. Excess CO2 means excess warming. We can NOT risk losing the economic “stability” of cheap fossil fuels, yet we MUST stop using them! What’s the back up plan? I did some basic research and come to the conclusion that molten fuels type nuclear reactors (and the traveling wave reactor?) concepts would provide power at a cost comparable to that of coal. I do NOT know if the risk of proliferation should be considered a show stopper. Considering that the world is already at war for fossil fuels, a LFTR based energy economy may provide LESS of a risk of a nuclear attack. I DO know that the safest way is to find a clean energy source CHEAP enough to compete with coal and nuclear (and monitor all areas of the world for nuclear activity, anyways). Do you believe that the exponential growth of solar is possible, to such lengths? Since 15% efficient panels would have to cover about 1 or 2% of the Earth’s surface (to out pace fossils) would the conversion of (about 85% of the) sunlight into extra infrared heat cause problems, and if so, can solar panels be made to be not as dark in color? Without nuclear, machine made solar (and mega storage) is our ONLY choice that can replace fossil fuels barring a new invention such as fusion, right? One more question: Is it true that giant reservoirs of molten salt and metals can be used to make utility scale batteries? Last year I was a guest on NPR’s Science Friday, discussing thorium reactors. You can listen to the show online. This post was originally posted years ago. I dropped the ball on this blog and stopped writing; I have now resumed it. I do not believe that any new reactor designs — i.e. significant departures from currently used commercial designs” would be available in time to do any good, given the speed and depth of energy climate disruption. And liquid fuel thorium reactors would not solve the proliferation problem. I don’t think increasing nuclear proliferation risks while reducing CO2 risks is a good idea. We can do better. When I first finished Carbon-Free and Nuclear Free it was only an analysis. Now it is springing to life in many places, most importantly in a highly industrialized country that is determined to phase out nuclear power: Germany. See their energy transition webpage.